On October 24, Professor P.S. 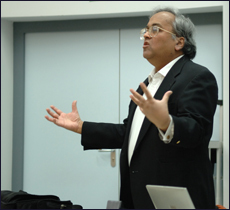 Krishnaprasad (ECE/ISR) delivered the Munich Mathematical Colloquium for fall 2006 at the Technical University of Munich, Germany. His subject was Geometric Control, Cohesion and Pursuit. This lecture included joint theoretical work on swarming and pursuit with former ISR faculty Dr. Eric Justh (now at the Naval Research Laboratory) and ISR alumnus Dr. Fumin Zhang (now a research associate at Princeton University). It also incorporated work with Associate Professor Timothy Horiuchi (ECE/ISR), Professor Cynthia Moss (Psychology/ISR) and her former Ph.D. student, ISR alumnus and current postdoctoral researcher Dr. Kaushik Ghose, on pursuit of insect prey by the echolocating bat Eptesicus Fuscus. Earlier in the year he had lectured on closely related themes at Caltech, UCLA, Harvard, and North Carolina State University.